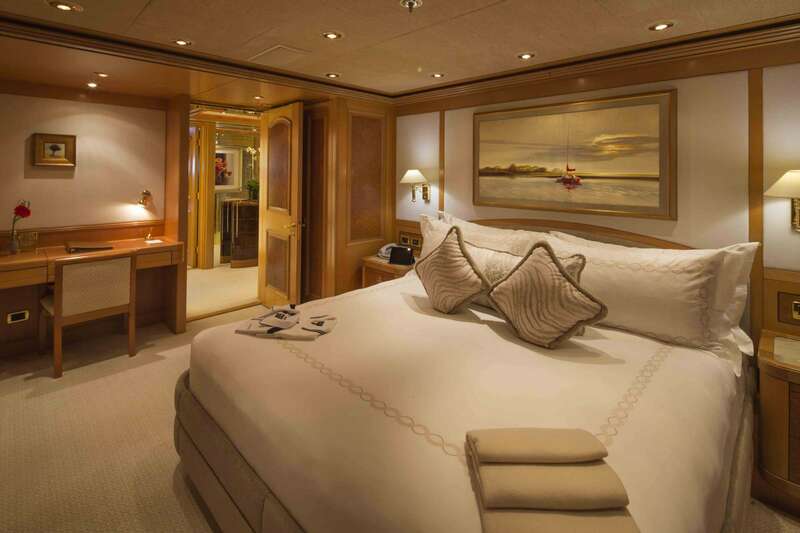 Leading further forward is the OWNER’S SUITE; a very precisely positioned stateroom not quite fully forward on this deck, allowing for the most comfortable cruising and obviously the grandest of them all. A well thought out alcove allows for undisturbed room service, inclusive self-catering coffee, refrigerator and a sink. 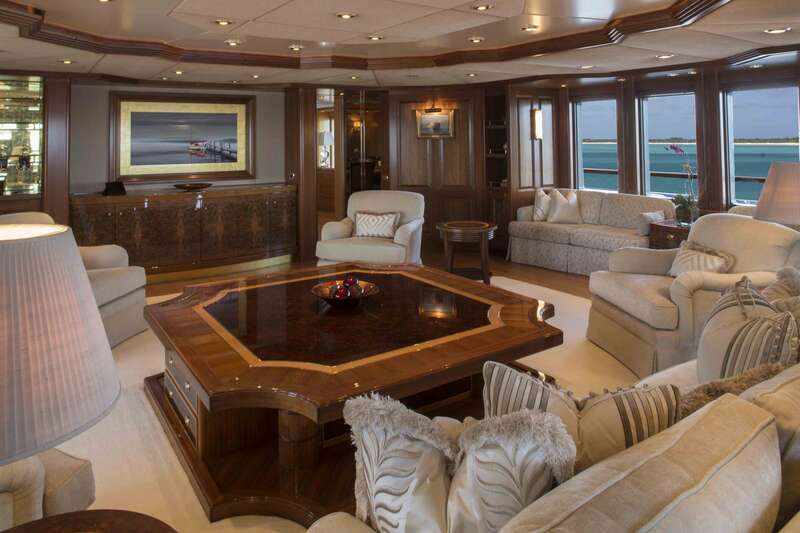 A full lounge and office suite continues as onward entry to this area and can be closed from both sides for more privacy offering the perfect starboard view. 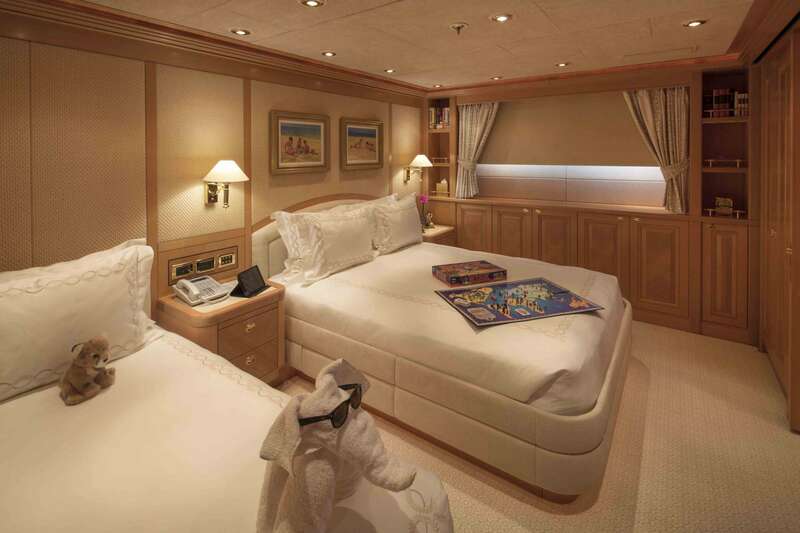 Entering into the stateroom, an additional lounge, King size bed and large en suite bathroom inclusive of oversized shower, double sinks and private enclosed toilet. Large walk in his and her wardrobes are situated on either side. 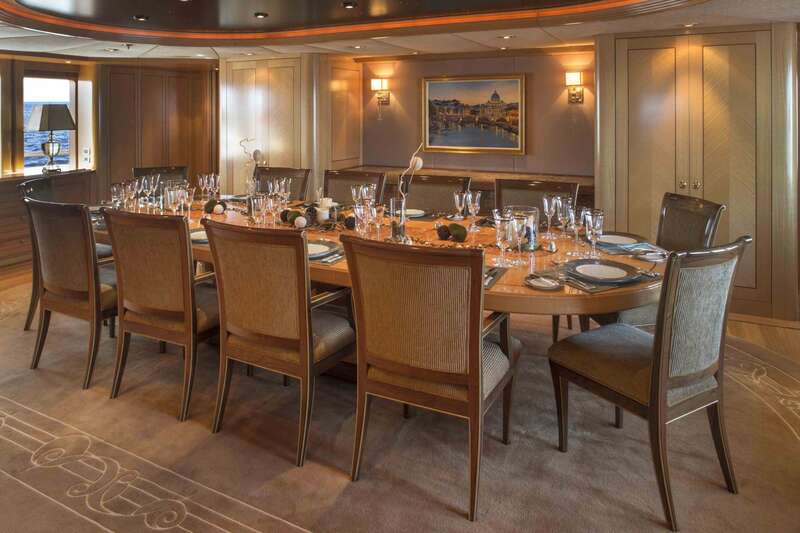 The ultimate feature - step out onto your own private veranda port or starboard side whether at anchor or while cruising. Above all is the SUN/OBSERVATION DECK where in the forward section guests have a quaint lounge for panoramic and protected views in raised seating while cruising. This is also a quiet place for afternoon tea, a few early risers’ private breakfast or for an uninterrupted business meeting. The forward doors lead to a semi-sheltered private deck serving as an extension of the observation room into the outdoors. 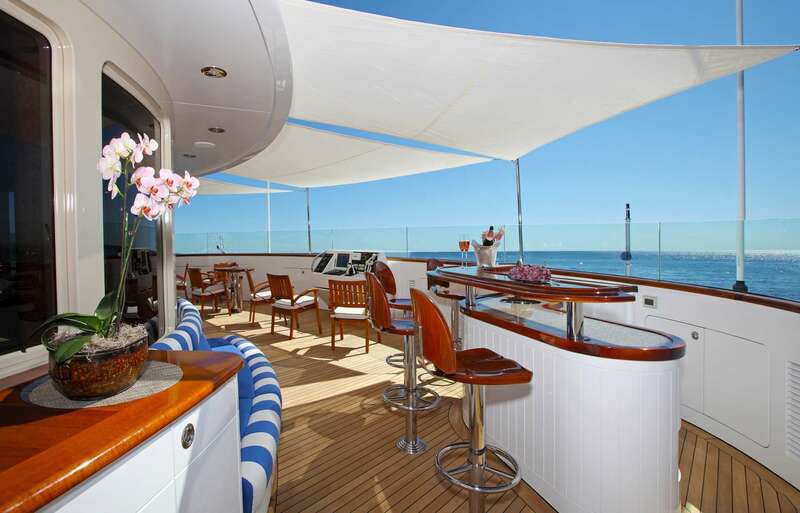 The teak and granite starboard bar seats three or enjoy cocktails at the tables and chairs to port. 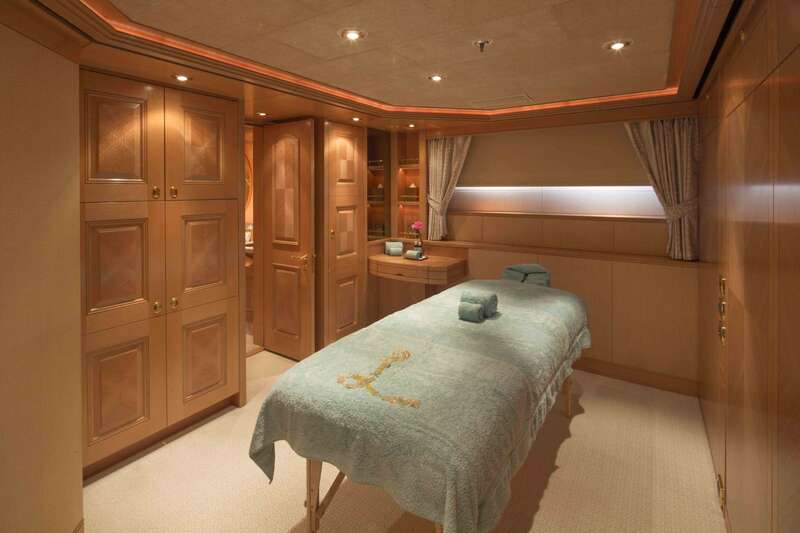 Aft of the Observation Room is the fully equipped GYM, day head and service/ bar area. Moving outside is a space that is considered - sanctuary at sea. The most expansive area on the exterior where the central Jacuzzi sits between a glass enclosed shower and herb garden. Chaise lounges, sun beds and removable furniture provide a multitude of arrangements to suit the mood and desires of guests. 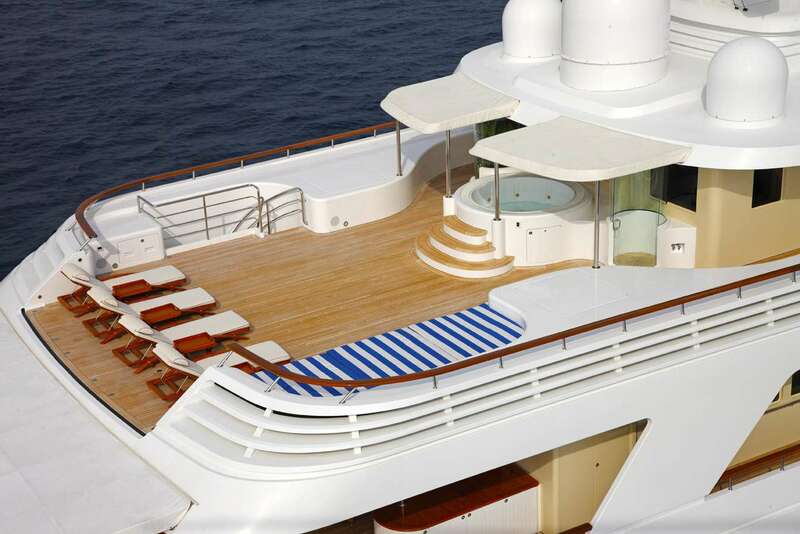 Easy access from the aft staircase leads straight down to the main deck and further to the BEACH CLUB. 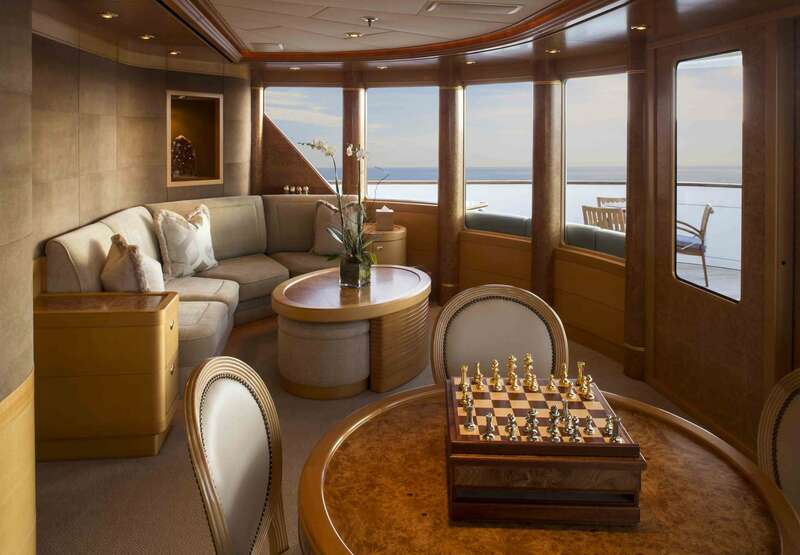 With the garage door open, this area transforms into a playground at sea. Easily access the water for a swim or take one of the multitude of toys for an adventure. For longer excursions, the crew will quietly deploy one of the tenders from the retractable garages to port or starboard – you won’t even see them do it but they will arrive at your convenience in a moment's notice.